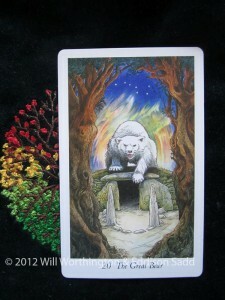 Welcome to the final Tarot Blog Hop of 2012!If you reached my site from the previous hop of Jon Michael Allen then welcome! You’ll find the next link at the bottom. If you come here as you normally do, you’re still most welcome, but there may be some interesting takes on the subject in other hops and you’re invited to go and read as many as you can! We’re at the time of Yuletide, so near to Christmas and here in the northern hemisphere, it’s cold! Mention snow, December or winter to a child and they’ll almost certainly mention Christmas and presents. Presents is what this Blog Hop is about. There are many meanings to the word “present”, for it depends if you use it as a verb, noun or adjective. Do you want to unwrap the moment that is presented to you, or do you want to digest it? 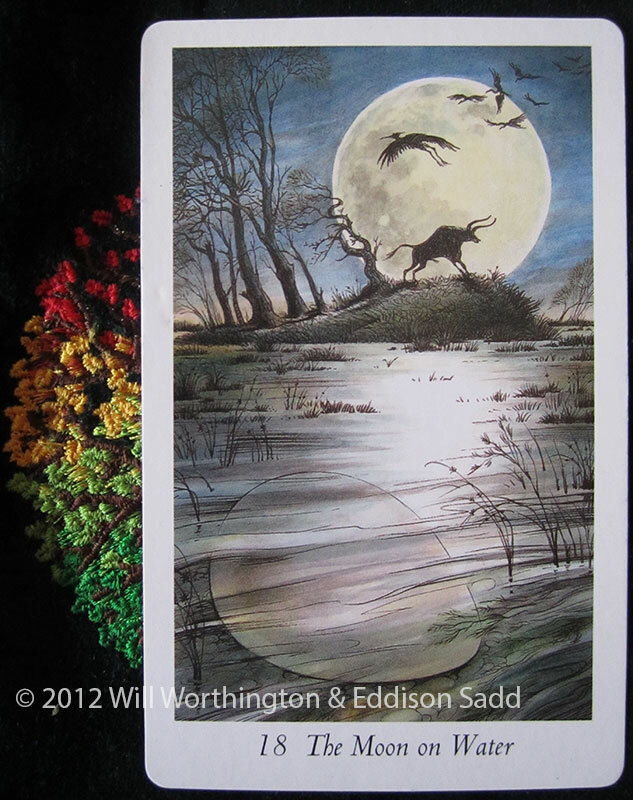 The Wildwood has various cards that are designed to “sit” at this particular point of the year. The two that have appeared for me more than most of late, are The Great Bear and The Hooded Man. Within the card of The Hooded Man, we see the shrill little Wren sit upon a rock, observing quietly. Behind the Hooded Man lies the ill-fitting door to the World Tree, which boasts a wreath made from Holly and Ivy. For me, this time of year is often the time of year we all sit and think of resolutions for the New Year, things we want to change, improve upon, things we need to stop doing. 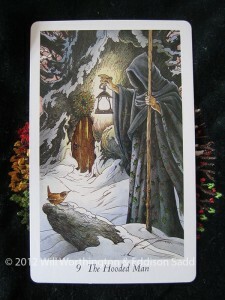 The Hooded Man is The Hermit, we find our own way by taking the time to listen to our inner-self. 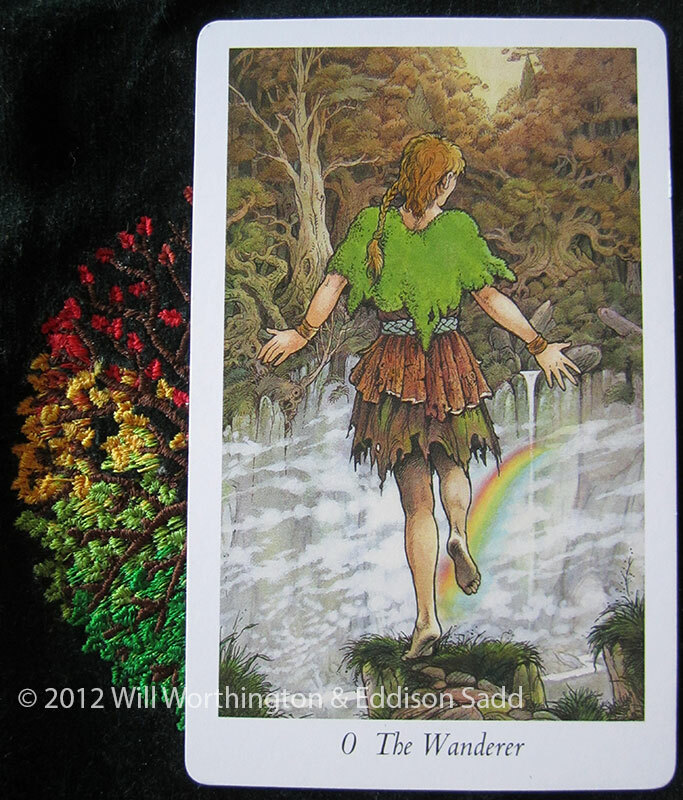 The other card that pairs with the Hooded Man is The Great Bear, the Wildwood’s answer to Judgement. Once we have decided on what we want to change within our lives for the coming year, how we determine our course of action comes up next. What we do in nature, nature balances out. Simple, huh? Here, the Great Bear reminds us of the same. How we do something causes a reaction to balance it out, so do what you need to in order to achieve your goals, but keep things balanced, keep things in check and remember that what you do has a consequence somewhere along the line. Hopefully, it’s a good consequence, an improvement on the current situation. 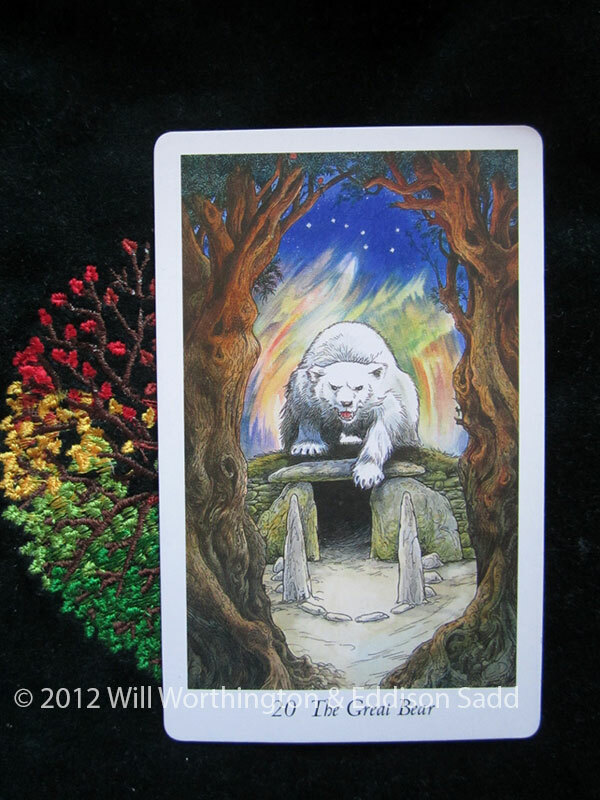 The Great Bear protects the initiate inside the Passage Grave and if you notice, above the bear, the constellation of The Great Bear itself is shown. Whilst you work out what move to make, when to emerge from the Passage Grave, I have the impression of whomever is inside (you, perhaps?) is being protected, shielded. 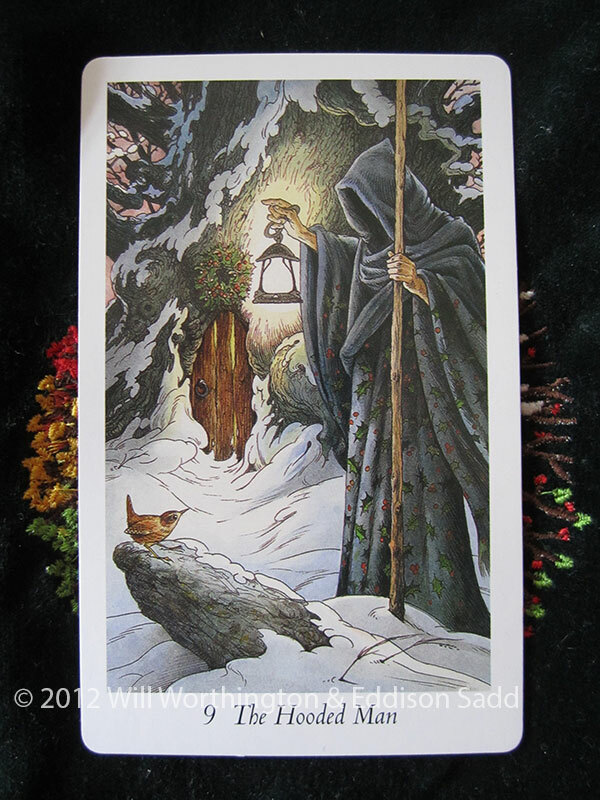 The other two cards that come up in the Wildwood Wheel of the Year are the Wanderer, for we often begin new adventures, or decide to, during New Year. They’re called Resolutions for a reason: We resolve to make things better for ourselves and those nearest and dearest to us. We know what we want to improve with the help of the last card, The Moon on Water. It’s one card of intuition, the dreams and instinct that has not yet, manifested but sits deep within us, waiting to come forth at the right time, when we’re ready to finally listen and realise what we’re feeling and instinctively know. So, with four Majors coming out to help us, not to forget the entire suit of Stones (aka, Pentacles) what are YOUR resolutions going to be? Are they going to be as big as the Majors, or will it be little things that change us in small, but still, significant ways? I personally, will be going for the Suit of Stones, to make small changes personally. I’ve more than enough “big” changes coming my way, right around the time of Imbolc. To jump to the next Hop, which belongs to Koneta Bailey at New Paths Tarot, click on the link to the right and have fun! And with this message, I wish you a very Merry Christmas, Yuletide or whatever you celebrate! May you keep your family safe and close by, if you love them enough! Best of luck and Happy New Years! This gave me a lot to think about. A very lovely thing. Thanks. Louise, you indeed have a large thing to do come Imbolc, but something that nature will process you through (except for the bit about decorating a nursury!). 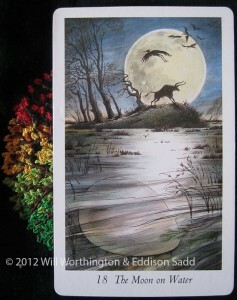 Your use of the Wildwood Tarot here is very useful since it follows the Wheel of the Year. Excellent cards to build structure for the future and enjoy the present of this cold season at the same time. I have found the Wildwood difficult to work with, but you tie it together rather more nicely even than Mr. Matthews does. Joanne, you’re very kind! And yes, I have something quite large, kicking and she’ll be screaming when she joins us on this planet at around Imbolc! I’m glad you like my take on the cards, enjoy the present! What a great blog post to finish the hop on! I plan to do just small things, I think. But hopefully the small things will add up to something greater than its parts. Somehow! Oh, I’m the last on the hop then?? I hadn’t realised! Blessings to you too, Alison and thank you for being there on my Tarot journey too! May we always have contact in walking this path: Doing so in company is better than alone! With blessings to you and yours this coming New Year! Lovely as usual, my dear! Enjoy the holidays! Thank you, Christiana! Enjoy the holidays too – I hope it’s not too warm or wet where you are? ?